OH earned 3rd in Overall Spirit at the Convention!! As always, the week of National Convention has quickly disappeared. Each day is filled with activities and events, and the last day is no different. OH fielded an Ultimate Frisbee team for the morning competition. Some of the girls are on a Cincinnati team which will play in the Youth Championship in a few weeks in Minnesota. They played well, but a tough IL team beat them in the finals. All the projects had to be picked up today. For Summit students, there were a number of winners: 3rd in Tile Mosaic for Dustin Argo, 1st in Dolls for Carolyn Boyce, 3rd in Poster for Kevin Boyce, 2nd in Multimedia for Myles Casanas, 2nd in Dolls for Anna Delamerced, 3rd in Jewelry for Tino Delamerced, 5th in Bead Mosaic for Carter Hall, 1st in Games for Christian Lipa, 2nd in Pencil Drawing for Natalie Whitsett, and 1st in Charts for Nathan Whitsett. Jenna Galletta (Lakota East) won a numerous awards for her Graphic Arts, including 6 1st place awards. In fact, Jenna earned 2nd Overall in Total Graphic Arts Points and 9th in Overall Convention Points. Eugepae, Jenna! Sam and her fellow board members are sworn in as national officers. 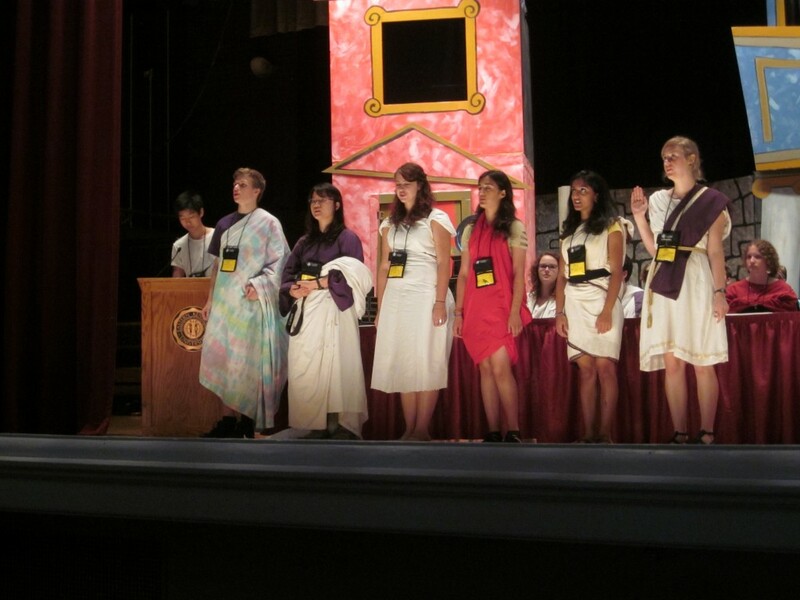 Sam Buck (Westlake) was sworn in as the NJCL Parliamentarian. In addition, Dan Garrett (Lakota East alumnus) was voted NSCL President, and Megan Whitacre (McAuley) was selected NSCL Editor. OH – the sponsors, the college students, the high school students – thus continues its long tradition of leadership in the JCL organization. Dan and Megan take the NSCL Oath of Office. In the Open Certamen, Gregory Pataky (St. Edward) was a member of the 3rd place Novice team, and Connor Tomshank (St. Edward) was part of the 1st place Novice team. In the Upper level, Catherine Daun (Indian Hill) was a member of the 1st place team. 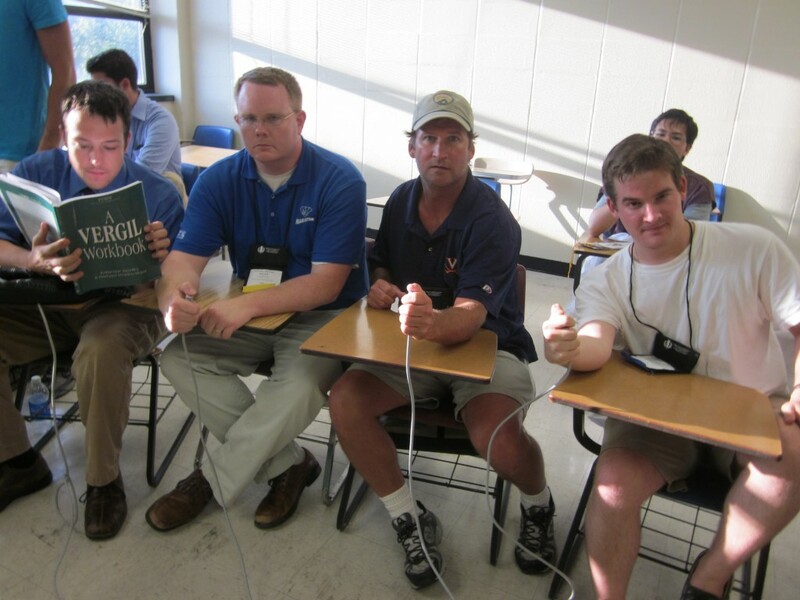 In the Academic tests, OH earned a number of top 5 in the nation: 5th in Latin Vocabulary for William Morris (Columbus Academy), 2nd in Grammar for Andrew Boudon (St. Edward), 3nd in Grammar for Connor Tomshack (St. Edward), 1st in Ancient Geography for Narayan Sundararajan (Shaker Heights), 1st in Greek Derivatives for Tino Delamerced (Summit), 3rd in Roman History for Nathan Patterson (Summit), 1st in Heptathlon for Sameer Apte (Shaker Heights), 4th in Latin Vocabulary for Ben Robertson (Shaker Heights), and 2nd in Mottoes for Paul Slater (Summit). The OH state t-shirt, designed by President Anna Delamerced (Summit) won a number of awards, including 2nd Most Creative, 3rd Overall Visual, and 4th Best Overall. Here is a nice look at Anna's award-winning OH t-shirts! 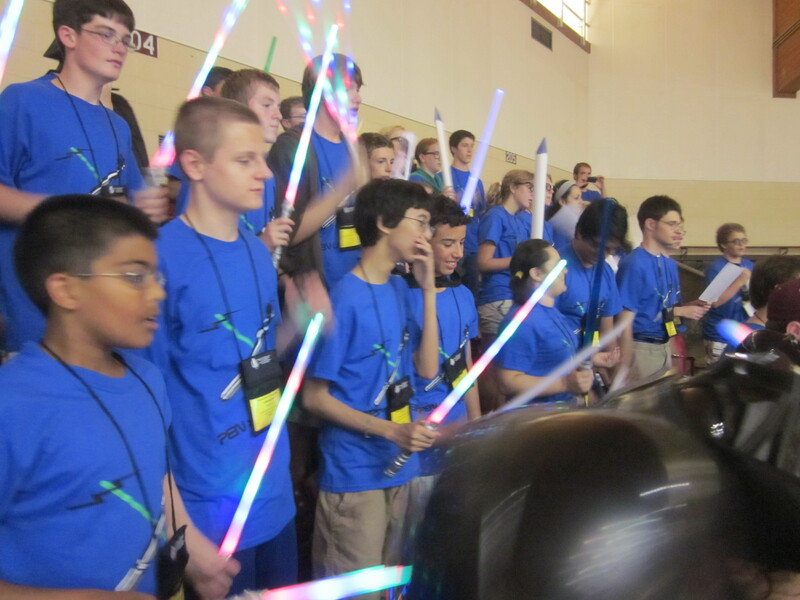 In Spirit, OH won 3rd Overall for Large States. Treasurer Heather Smith (Shaker Heights) worked very hard each GA to make sure that OH had a consistent showing in Spirit. The prize? Silly Bands for everyone! 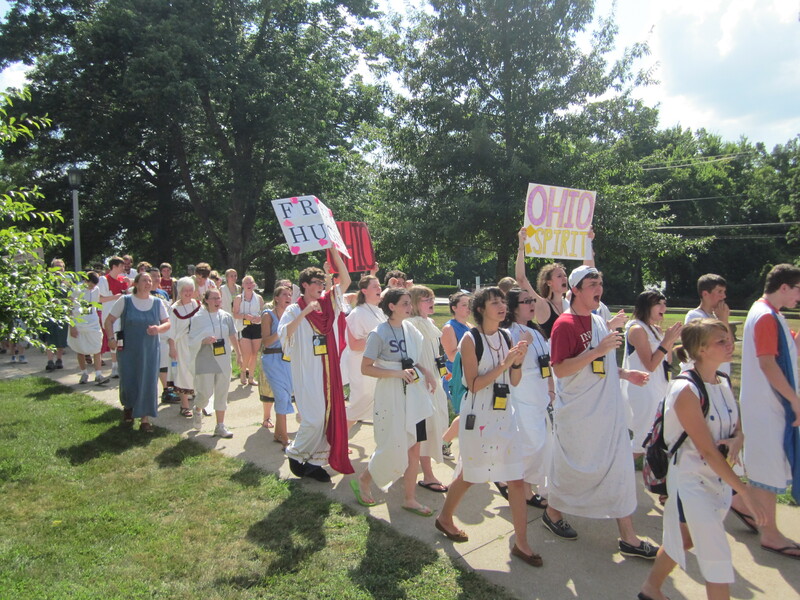 There was the annual toga parade to the final GA of the week. 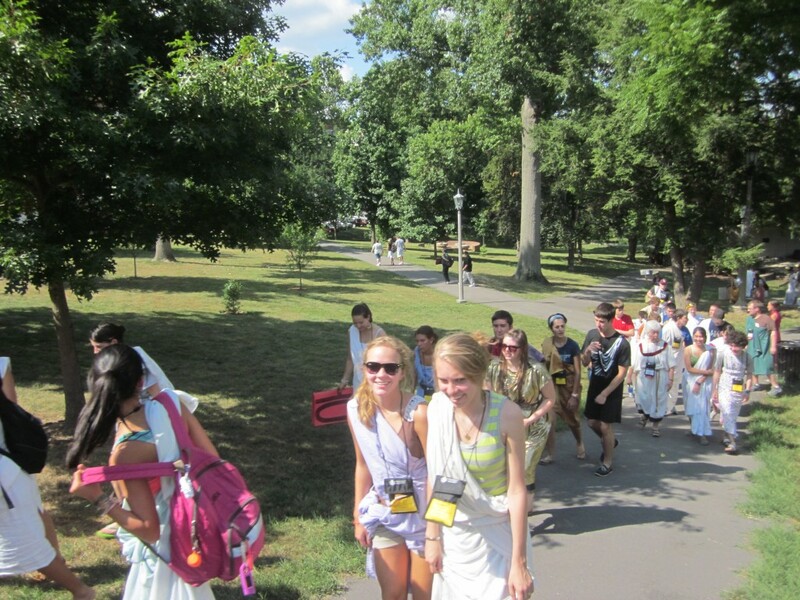 Check out the Shutterfly account for a bunch of pictures of toga-clad Ohioans. Spiritual Leader Sherwin Little directs the path of burnination for Team Trogdor. 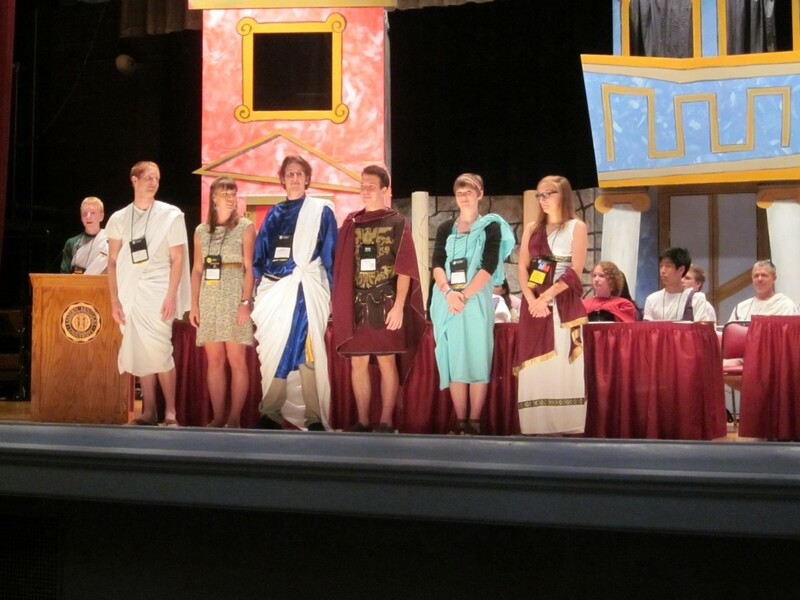 Lastly, after the outdoor dinner in togas, there was the World Series of Certamen. 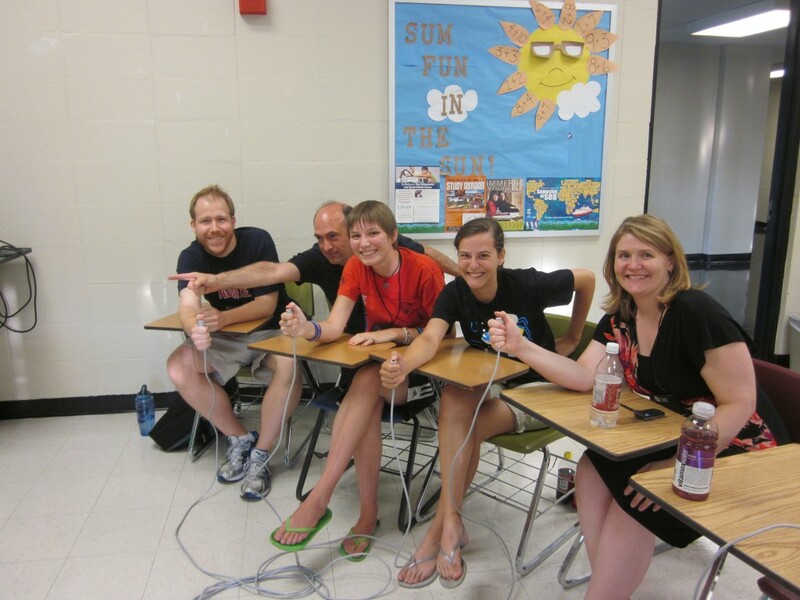 This is a fun event where high school graduates and teachers get to compete. OH had 3 teams this year. The ‘Supreme Breakfast League’ (Michael Cowett, Bryan Inderhees, Sarah Leonard, and Robert White) was involved in a shoe-throwing incident. ‘Team Trogdor!’ (Abbey Whitzgall, Kelly Schmidt, Rachel Kless, and K.C. Kless) succeeded in its goal of achieving burnination. And the ‘Bad Larrys’ (Brian Compton, Larry Dean, Chris Lapp, Wayne Memmot, and Megan Whitacre) had their best showing ever! The BL’s main ‘claim to fame’ is the longest-lived name in the history of the competition. Bad Wayne had a nasty thumb injury during the preliminary rounds, so rookie Megan Whitacre joined the veteran crew for the semis. The BL’s were 1 question away from the Final this year. But Kate ‘Evil Tarpeia’ Hattemer (formerly of OH, now of VA, but soon to be again of OH) stomped upon their chances of complete annihilation in the Finals. Bad Larry Memmott reviews his Vergil prior to his freak thumb injury. See everyone next year at Wake Forest (NC)! GO OHIO! !